It was the hottest, stickiest day so far this year. It was already 22 degrees, feeling like 30 at 9:00 in the morning. By the time we got back to the car the humidity was making it feel like 39 degrees. You need to carry a lot of water on days like this to avoid dehydration and possible heat stroke. Peel County was surveyed in 1818-1819 with settlement starting the following year. Settlers found a rugged terrain that was difficult to farm. 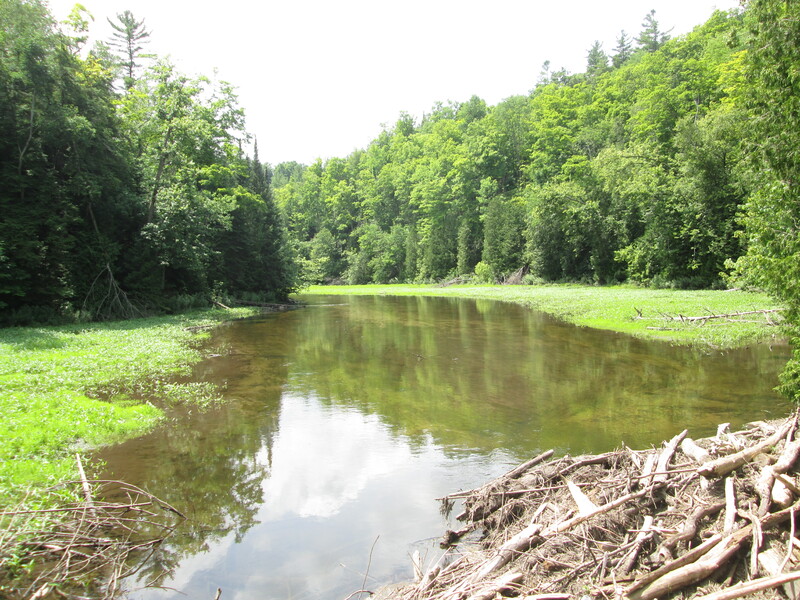 Lot 9 concession 4 was typical of the area and included a stretch of the escarpment where the Credit River cascades through a ravine. The property didn’t suit farming but there was plenty of Queenston shale and limestone as well as gravel deposits. 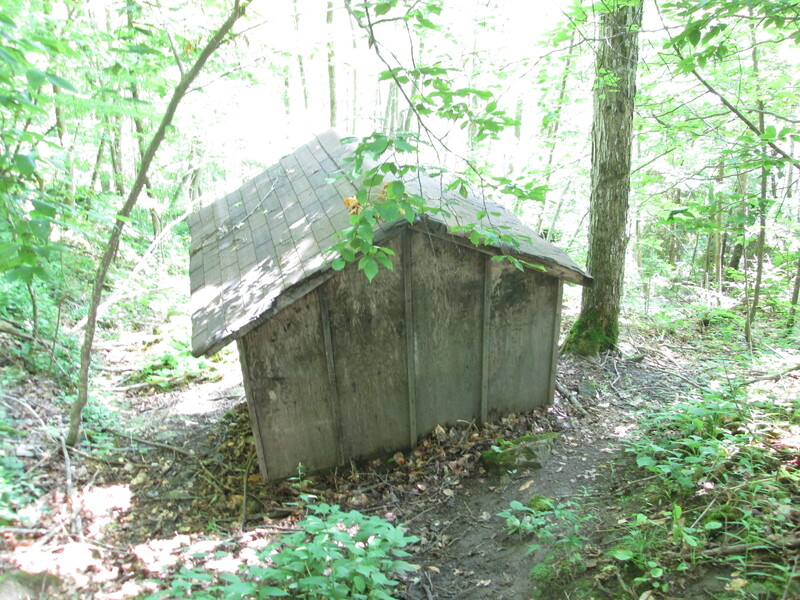 It would be used for quarry purposes from the mid 1800’s until the 1930’s. In 1986 the Ontario Heritage Foundation acquired the property in a combined purchase and donation from Bert Willoughby. Now known as the Willboughby Property it is west of the Devil’s Pulpit which we visited last week. Historical research conducted in 1988 identified several items of cultural heritage significance, a few of which are presented below. We parked on the end of Scott street and entered the park near the old gravel pit. As we entered the laneway to the former caretaker’s house we found a single yellow daylily. These plants usually grow in small clusters so finding a single flower is unusual. They get their name from the fact that the flowers only last for a single day. They bloom overnight or in the morning and wither up the following night. A new flower may grow on the same stem and if the flower is cut off it will continue to bloom for several days. They come in many brilliant colours with this one having brown stamen which are the male parts and a yellow carpel, or female part. 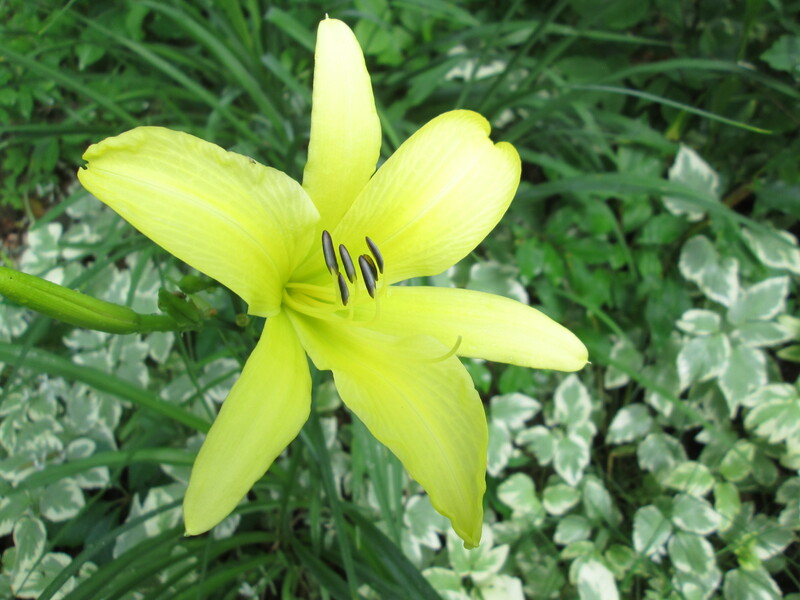 This example is known as a lemon lily. At the west end of the property a gravel pit operated until the 1930’s. Nearby stood a barn and workshop as well as the caretaker’s house and a windmill. 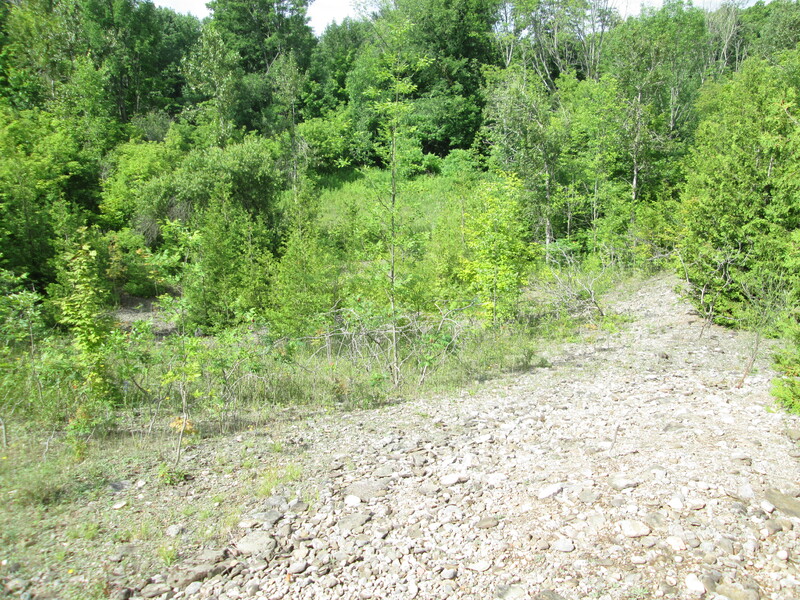 The gravel pit has started to grow over with trees as can be seen in the picture below. 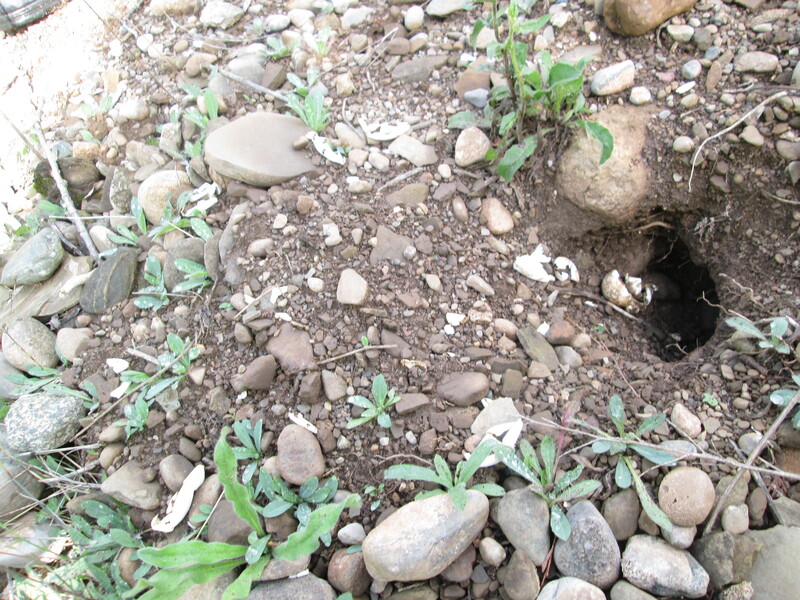 We found evidence of the the other structures but they appear to have all been removed. As you follow the trail along you will come to the Crow’s Nest side trail. To the left this trail runs past the Hillis Quarry overlooking the Forks road. To the right it runs past Crows Nest Quarry and several smaller pits where limestone and sandstone were cut from the hill side. We took the side of the trail along the Hillis Quarry which eventually loops back toward the river. Along here an old pump house stands. Behind the pump house stand two old bridge abutments made from blocks of cut stone. 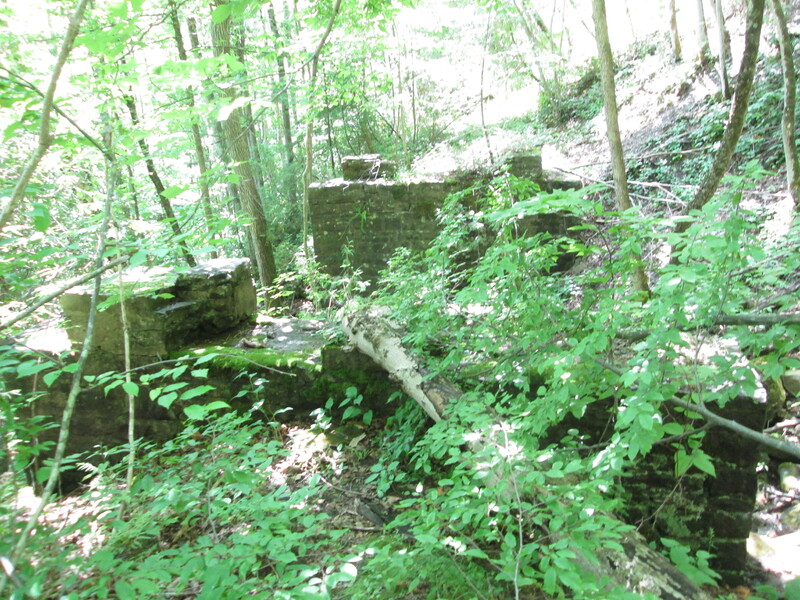 These supported a siding from the Credit Valley Railway (CVR) that ran to the quarries. The cut stone from these quarries was used to build some of the grandest buildings in Ontario in the late 1800’s. 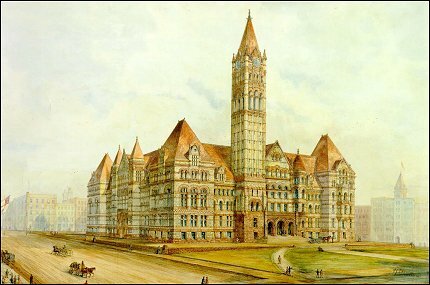 What we call Old City Hall in Toronto was actually the third city hall. It was completed in 1899 using 1,360 train car loads of cut stone. The grey stone came from the Credit River Valley and may have crossed the bridge shown in the previous picture. The brown stone was brought from New Brunswick. The picture below shows the water colour that was created to promote the idea of building a new city hall. 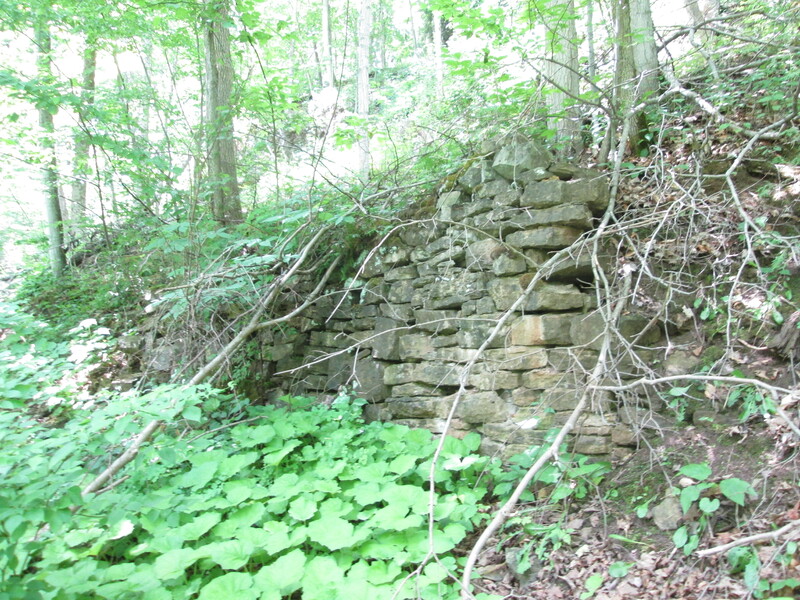 The CVR retaining wall along the siding is part of the built or human heritage on the property. With the rails pulled up and trees growing on the former rail bed this almost appears to be a random wall built in the woods. The retaining wall is yet another example of the use of cut stone on the property. The rail siding to the quarries on the Willoughby property joined the CVR near the train station. The train station sat in the clearing at the hairpin turn on the Forks of the Credit road. 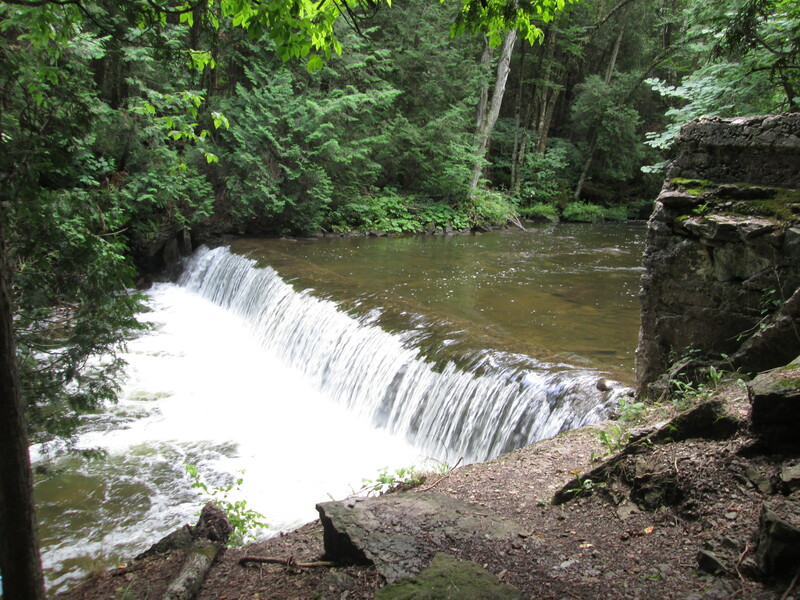 The Willoughby dam is about 100 metres upstream from the Forks of the Credit road along a Bruce Trail blue side trail in the bottom of the valley. With a rise of 1.5 metres it is a migratory obstacle to all but jumping species of fish such as salmon and trout. Along the side of the river we found a recently hatched nest of Eastern Snapping Turtle eggs. This turtle is considered to be of Special Concern in Canada. The empty shells look like little curled up strips of paper running down into the hole. Up river from the concrete dam is a mid 1800’s structure made of blocks of cut stone. The stonecutter’s dam has a unique stone penstock that can be seen in the cover photo. The penstock is a stone tunnel extending from the downstream side of the dam. The intake in the wall of the dam was higher than the exit causing the water to fall through the penstock to deliver energy to turn a turbine or water wheel. 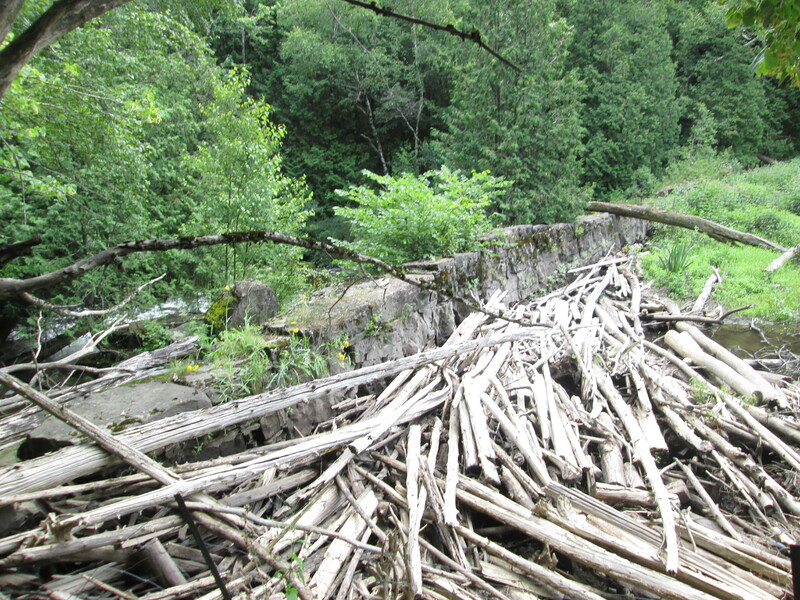 The picture below shows the back side of the dam where a large amount of wood has been washed up over the years. Many dams were washed out in the major floods of 1878 and 1954 but the stonecutter’s dam has survived. When the Willoughby property was acquired and a conservation plan was developed the restoration of this dam and it’s associated mill structures was reviewed but unfortunately dismissed. The mill pond behind the stonecutter’s dam is filling up with silt and weeds. The dam was considered to be impassable to migratory fish but a single salmon was recently caught upstream and this suggests that some can go through (or get tossed over by fishermen). 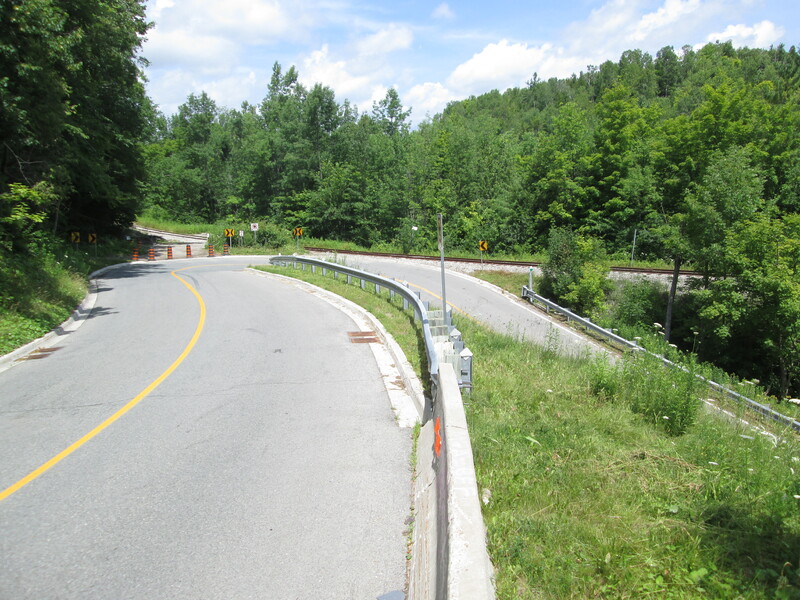 If you follow the trail past the dam you will have to continue into Belfountain. The Willoughby property has been used for farming, quarrying and has now been turned into a park that hides it’s abundant history among the new growth forest. The Black-Crowned Heron in the picture below was photographed a couple of days earlier but this bird was auditioning for a spot in the blog by posing for pictures. This stocky little heron stands up to two feet tall and can weight two pounds. Unlike the great blue heron, night herons do not have long necks and legs. The Forks of the Credit contains ample space for future explorations of it’s natural beauty and historical artifacts. 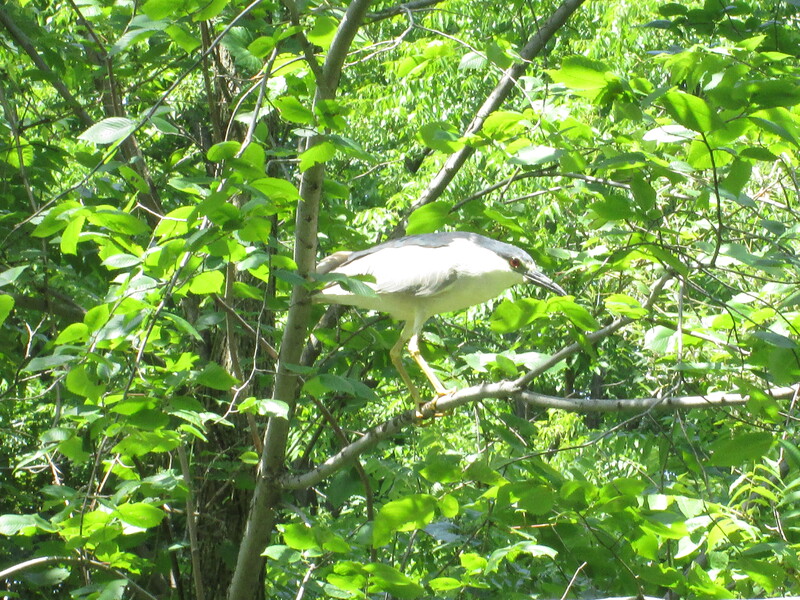 This entry was posted in Credit River and tagged Black-Crowned Night Heron, Bruce Trail, Credit Valley Railroad, daylily, Forks of the Credit, Stonecutter's Dam, Willoughby Property on July 19, 2015 by hikingthegta.